It would be a smack of disservice to my country, by subscribing to the generally held notion that Nigerians have a repulsive penchant of immersion into oddities. Much as there is this restraint, sadly though, it pains to realize that most of us operate in this country like people who are not only deprived of their history, but the precious natural gift of retentive memory. Most times, I am restless in my solitude, when I imagine, some of us think, we do not even have a history. And so, we ignore its alluring richness and potency to impact on today’s transiency. It’s like we exist only for today, which is anchored on nothing necessarily, but our peculiar idiosyncrasies’-most times, defined by partisan camps, ethnicity or religious persuasions. That’s why I am one Nigerian, who is so reserved in assessing the character and temperament of our people. To most of us, everything is right, so long as it comes from any of the aforementioned linings where we have affinity. But every other thing, message or action is wrong, including a replay of the prophecies of the Holy Scriptures known to us, so long as it emanates from tents opposed to our fondness. How Nigeria has continued to survive in the midst of the interplay of these minute and complex forces, astounds me endlessly. When anyone frees his or her mind, to reflect dispassionately like me, he would come to my inevitable shock. I do know that all races of the world learn from history, to reshape today to make tomorrow worthier and far rewarding. History bubbles with either optimism or cynicism about the future. It illuminates or darkens the path of tomorrow depending on the angle of navigation. But the peculiar idiosyncrasies’ of Nigerians today, which they hold tightly, tilt more towards the negative, than any progressive thought. So, no one wants to swim in the same boat with another to safety. It is the most shocking irony about us as a nation. Emerging from this mindset, no one wants to burden himself with assessing any dilemma from a nationalistic or patriotic perspective. 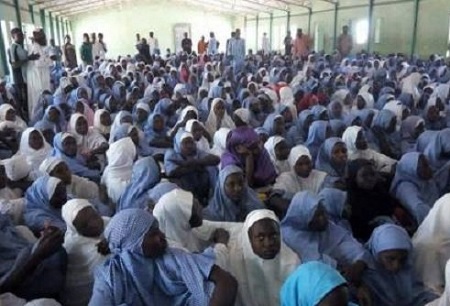 Today, in 2018, Nigeria is faced with the unfortunate predicament of the abduction (others prefer to call it, Kidnapping) of over 110 young, innocent Nigeria schoolgirls at a Government Secondary School, Dapchi, in Yobe State by Boko Haram insurgents. The Dapchi incident is a sad reminiscence of the 2014 abduction of the over 270 schoolgirls in Chibok, a village on the fringes of Borno state. Both Borno and Yobe states, as well as Adamawa are enclaves considered as the hotbed of Boko Haram terrorism in Nigeria. This singular incident only illustrates the extent to which our enemies are desperate to blight the efforts of the Federal Government of Nigeria (FGN), nay Nigerian military in freeing us from the manacles of terrorism. This abduction sings unpleasant jingles and points to a direction that suggests a setback to the on-going counter-insurgency campaigns in the country. However, I am one Nigerian who does not believe in the underground work of our fifth columnists and veiled enemies’ who disguise as friends. I am one human being, whose life is ruled by experience. It is the experience of yesterday that informs me whether its repetition today would neither overwhelm nor surpass me. It tells me whether I would falter before the molehill of today, when I shattered the hardest rock yesterday. These are easy lessons life teaches us every day. So far, my spirit is not dampened by the Dapchi episode of abduction of young schoolgirls by terrorists. Yes, it is painful, traumatic and agonizing. The parents of the abducted girls particularly may cause to despair and feel forlorn. We have enough reason to be soaked in mourning, as a nation. But it should not dissolve our resolve or determination to throw back this battle to the enemies. It should not blur our senses about the grandeur manner we have decimated and defeated Boko Haram terrorism to restore security sanity to our hitherto plagued nation. Please, may I be permitted to freshen memories a bit. It is not my desire to repeat the obvious. But for clarity sake, a little insight into the inferno of terrorism which practically crippled Nigeria before President Buhari took over the reins of power and appointed the COAS, Lt. Gen. Tukur Yusufu Buratai as the arrowhead of counter-terrorism operations in the country. A lucid gaze at yesterday, none of us would deny that significant milestones have been achieved today on terrorism. Understanding the truth would not disfigure or harm anybody in anyway. No Nigerian, who has dwelt in the country from 2010 to early 2015 would not concede to the frightening tempo of terrorism in Nigeria. It was an unfortunate era, we were generally confronted with the most vicious and atrocious manifestations in these three states of the Northeast. And all over Northern Nigeria, Boko Haram insurgents had established its frightening shadows. Abuja and major cities in the North were at the mercy of these cursed monsters. They struck and killed unrestrictedly. Insurgents’ widespread network had started making ingress into Southern Nigeria. It was half way into its vowed voyage of the total capture of Nigeria. Nigerians cannot dispute that the devilish and monstrous religious extremists were ennobled by glaring government inaction (something akin to helplessness) and spread its tentacles of heinous crimes against humanity to unimaginable limits. It was wails and lamentations from across the land. But the Federal Government of Nigeria, in impressive alliance with the current Service Chiefs have not only decimated and defeated terrorism, but they are the last phase of clearance operations for the remnants of Boko Haram terrorists. And we must understand that terrorism warfare is the most complex, delicate and sensitive war to ever confront humanity. It does not end in a jiffy. Remnants of terrorists could resurge from sleeper cells to unleash unexpected attacks like the Dapchi school incident has demonstrated. But the leadership of the Nigerian military today cannot be rated on the same scale with what obtained yesterday, as evidenced by the counter-reactions and the rescued girls so far. Quite unfortunately, the incident is a painful slap on a humanity which craves for peace; it is an attempt to whittle down the impact of the efforts and sacrifices of our gallant Nigerian troops in securing our nation. I can decipher a loud and demonstrated commitment by the Nigerian Military that like the Chibok girls and thousands of other Nigerians freed from Boko Haram captivity; the Dapchi schoolgirls too would be rescued. Therefore, I don’t think those who feel the Dapchi abductions are enough to obliterate the records we have set in winning the terrorism war are truthful. Or should the incident even be a reason strong enough to reduce our appreciation of the efforts by the FGN or belittle the efforts and determination of the Nigerian military to rid our country of terrorists. Looking back at where Nigeria started the journey against terrorists, we can proudly assert today of more pluses than minuses. In the last nearly three years of the present government, no bomb has exploded in Abuja, Kano, Kaduna, Plateau and so forth. There are neither terrorists in Abuja nor are their shadows sighted anywhere in Southern Nigeria. Boko Haram terrorists have virtually disappeared from their prime and proudest of places in Nigeria. The remnants’ of insurgents have confined themselves to obscure localities, from where they sneak out to launch attacks like the unfortunate abduction of the Dapchi girls. But again, like the nearly 30, 000 Nigerians held captive by terrorists, but released by the Nigerian Army, this incident is too infinitesimal to either dampen the morale or resolve of the Nigerian Military in anyway. I sympathize with the parents of the victims, but a little patience and encouragement of Nigerian troops is most germane now. Madu is a researcher at the Badagry Leadership Institute and contributed this piece from Lagos.